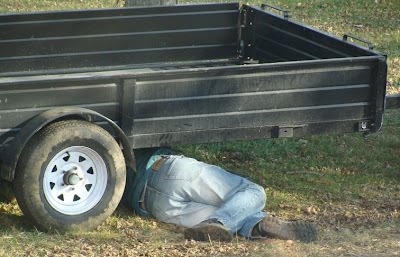 This photo was taken the last time we tried to use the trailer, in December. * It took Mike several hours to get the lights to work. It was a similar story yesterday: the lights were poorly-made and never seem to work consistently. Poor Mike spent much of the day stripping the lights down into their component parts and then giving up and going off to buy new ones. All so that he could get some more cedar planks and build me three more raised beds in the greenhouse. Meanwhile, the kids and I were having fun at a birthday party down the road. I provided lemon-meringue ice cream. It was the first time I'd made it and ended up being a combination of two different recipes. The idea was stolen from Delia Smith's Summer Collection, but the lemon ice-cream recipe was lifted from David Lebovitz's excellent book The Perfect Scoop. In that book, he crumbles speculoos/speculaas (gingersnaps from the Low Countries) into the lemon (I've made that version too and it is delicious). But since I was going to be making the ice-cream properly for once, i.e. only using yolks (I usually use whole eggs), I thought I'd make meringues with the whites and stir those in, instead. Make the meringue first: whisk the egg whites until they are stiff and then add half the sugar, a spoonful at a time until the meringue is glossy and holds its shape. Fold in the rest of the sugar. Heat the oven to 225°F/100°C/Gas Mark ¼. Put spoonfuls of the mixture onto parchment paper on a baking sheet and then bake for an hour and a half. Put the lemon zest and sugar into a saucepan with the milk and about a quarter of the cream. Warm it thoroughly and then leave to infuse for about an hour. Pour the remaining cream into a large bowl and set a sieve/strainer over it. Re-heat the infused milk until it is warm, then beat it into the egg yolks (it's important to add the milk to the egg yolks and not the other way round - they will curdle if you do!). Return the egg yolks and milk mixture to the pan and heat, stirring constantly, until the mixture thickens enough to leave a thick coating on the back of the spoon. Pour this custard through the strainer into the cream. Discard the pieces of lemon zest that will be left in the strainer and put the ice-cream mixture into the fridge to cool down until you are ready to make the ice cream. 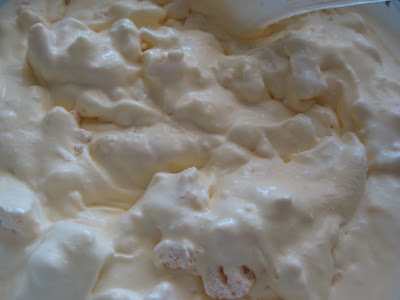 After you have got the ice-cream made, crumble or cut the meringue into small pieces, stir them into the soft ice-cream and then freeze until you need it. You have to take it out of the freezer at least half an hour before you want to eat it, to soften. *No husbands were harmed in the making of this image. I can tell you that the ice cream was delicious and she will be invited for all other birthday parties real or imaginary!! !